Griffon, the first vehicle in the SCORPION program, has been produced at Nexter’s factory in Roanne since 2018. Its manufacture is done step by step in two weeks, on an elaborate and connected assembly line. Delivery of the first Griffons will begin this year. An emblematic vehicle of the SCORPION program, the Griffon is a multi-role armored vehicle (VBMR). 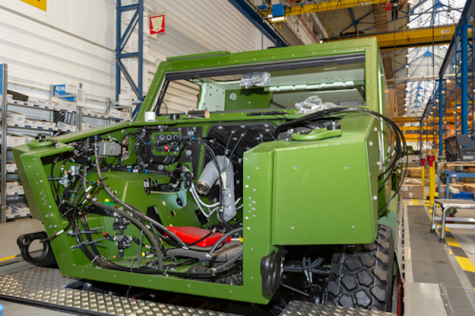 The Nexter plant in Roanne includes several assembly lines such as the Griffon, but also for the VBCI, for the operational maintenance of vehicles and equipment and the iconic Leclerc tank. During its manufacture, the Griffon moves from station to station. This organization facilitates logistics, as the parts are specific at each stage. Occupying about 110 meters by 20 meters, the exoskeleton must first be made with metal plates measuring 8 meters by 3 meters, which are then machined, drilled, welded and treated. The wheel train, the wiring, the transfer case and the fuel tank are assembled at the beginning. The vehicle is turned upside down at the beginning of its manufacture to facilitate the work. "Keeping the vehicle on its back during these first two phases reduces the difficulty of the work and the risk of accidents," explains Julien, head of the production line. Then, the vehicle is turned right side up using an articulated arm to assemble all the wiring. Then comes the interior layout (seats, doors, steering wheel, etc. ), the powertrain installation and the engine. Throughout the assembly line, the assemblers have at their disposal the latest generation of tools that facilitate the assembly of Griffon: touch pad and connected torque wrenches. The manufacturing execution system connected to the tablet allows operators to have up-to-date documentation, to avoid reference reading errors of the parts, to facilitate the traceability of the vehicle or to request the delivery of parts to the platform logistics. This is true progress, and as such these connected tools are appreciated by the operators under Marc, a methods engineer: "while it was formerly compulsory to perform a double tightening, this key allows to operator to know the tightening power while controlling and 'recording. Even the oldest operators appreciate the simplification of their work brought by these connected tools." In two weeks, a Griffon is manufactured and ready to spend a few days going through builder trials. In addition to the Griffon, the Nexter site will also assemble other emblematic vehicles of the Scorpion program: the Jaguar from 2020 and the Serval from 2021.